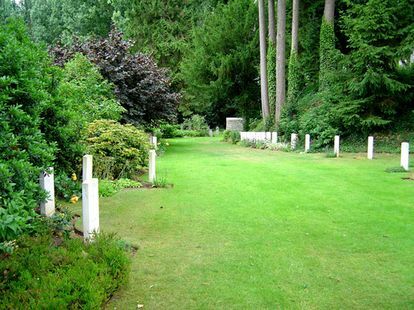 This is an unusual style of military cemetery, concept as a garden, oasis of peace where you find Commonwealth and German graves. 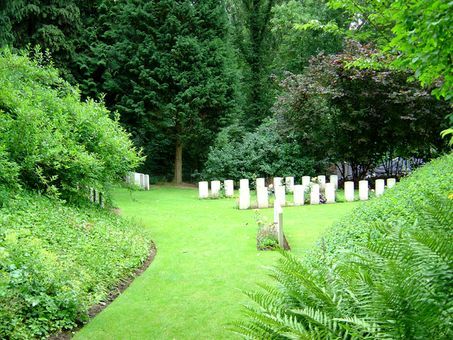 St. Symphorien Military Cemetery was made by the Germans in August 1914, after the Battle of Mons. 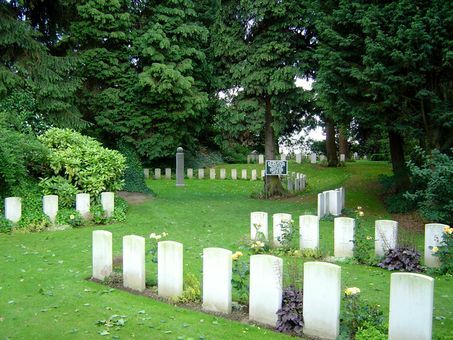 It remained in their hands until November 1918, and has the distinction of containing the graves of some of the first and last casualties of the First World War. 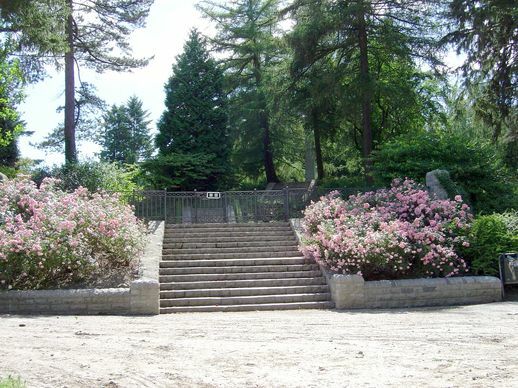 The site for the cemetery, an existing but artificial mound, was the gift of local resident Jean Houzeau de Lehaie, and was laid out with great care to create the effect of a wooded garden or park. 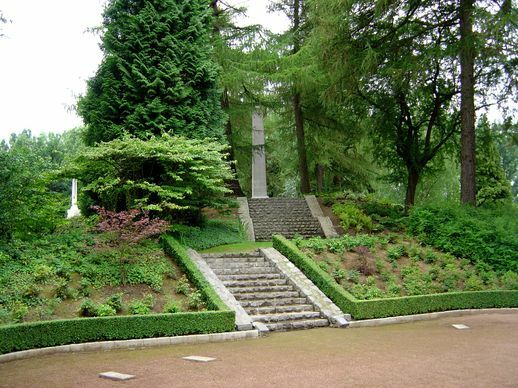 At the highest point, there is a granite obelisk some seven metres high, erected by the Germans in memory of both German and British servicemen killed in the actions near Mons in August 1914, and elsewhere in the cemetery there are further German memorials to officers and men of the Middlesex Regiment (Plot III), Royal Fusiliers and Royal Irish Regiment (Plot VI). 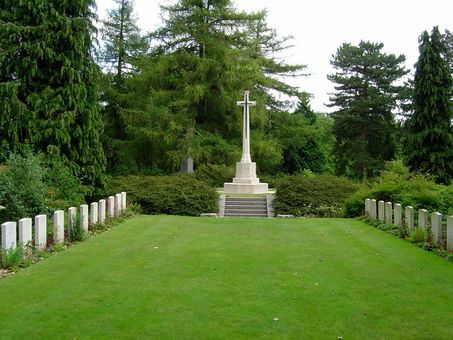 At the Armistice, the cemetery contained the graves of 245 German and 188 Commonwealth servicemen, but further graves were brought in later from other burial grounds* in the area. 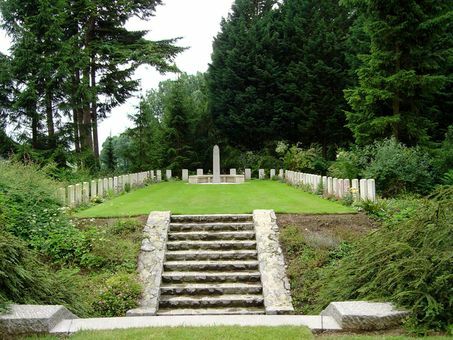 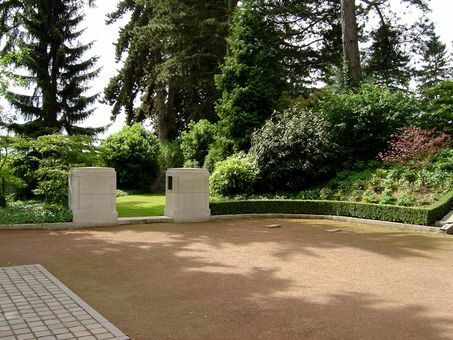 There are now 229 Commonwealth servicemen of the First World War buried or commemorated in St. Symphorien Military Cemetery. 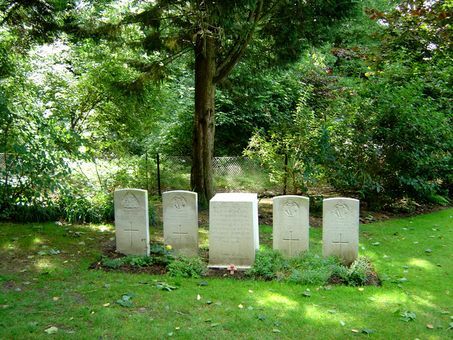 65 of the burials are unidentified but special memorials commemorate five casualties believed to be buried among them, and four casualties buried in Obourg Churchyard whose graves could not be found. 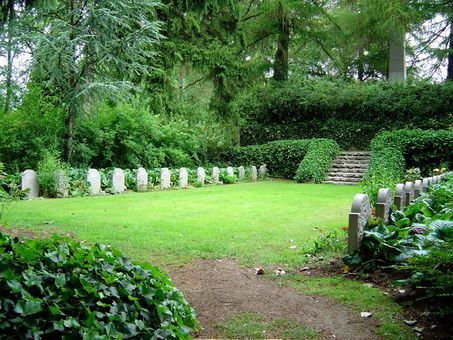 The cemetery also contains 284 German war graves, marked by headstones in a variety of different styles. 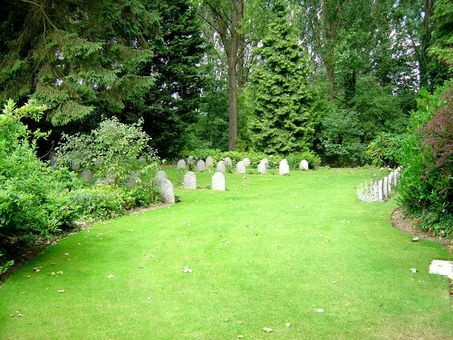 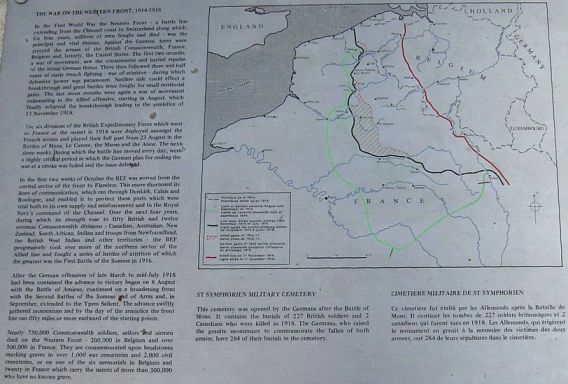 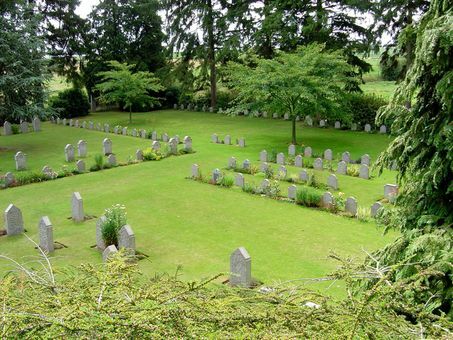 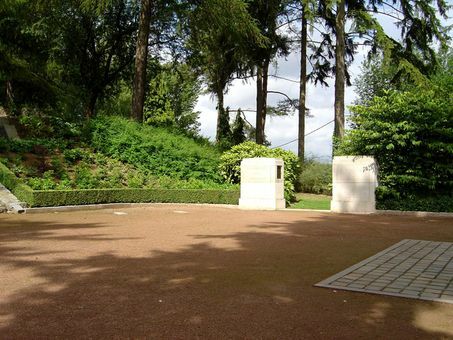 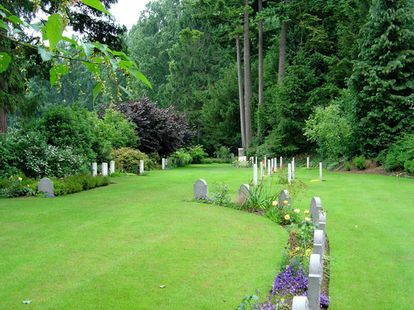 St. Symphorien Military Cemetery is popularly believed to contain the graves of the first (Pte. 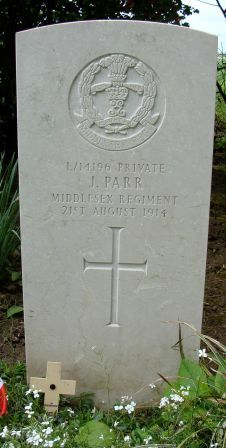 J. Parr, Middlesex Regt., 21 August 1914) and the last soldier (Pte. 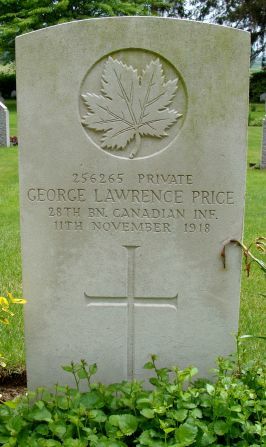 G. L. Price, Canadian Infantry, 11 November 1918) to be killed in the First World War. 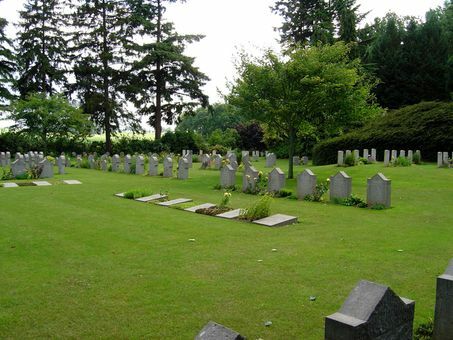 * Gembloux Communal Cemetery; Havre Old Communal Cemetery; Norchain Churchyard; Obourg Churchyard; Spiennes Communal Cemetery; St. Symphorien Churchyard; St. Symphorien Communal Cemetery; Wasmes-en-Borinage Communal Cemetery. 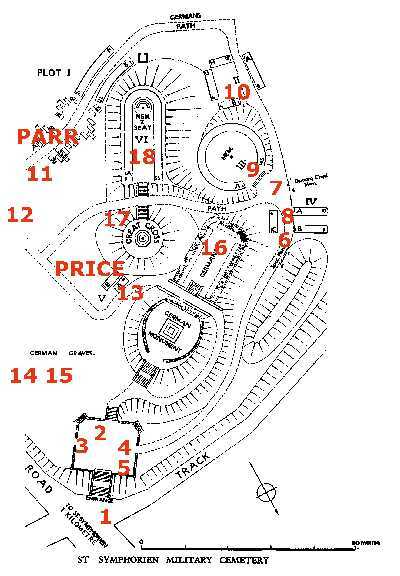 I propose you a complete visit. 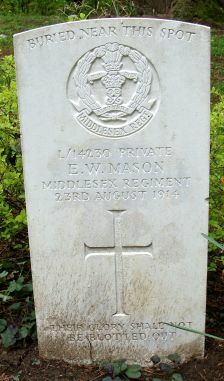 (ELLISON) The grave of the last believed Commonwealth soldier, killed on battle field, Pte. 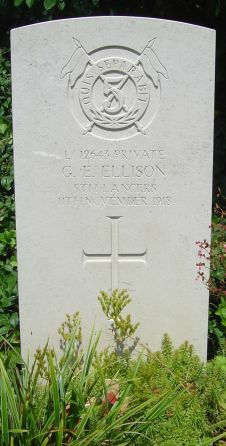 G. E. Ellison, 5th Lancers, 11 November 1918. 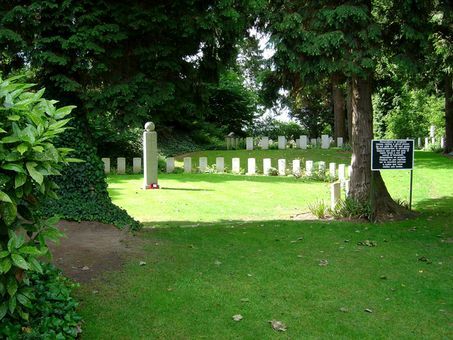 (PARR) The grave of the first believed Commonwealth soldier, killed on battle field, Pte. 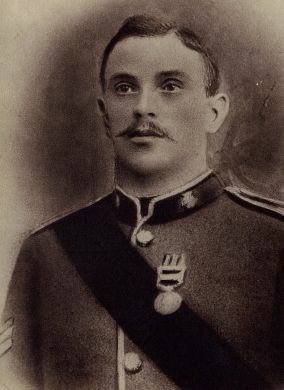 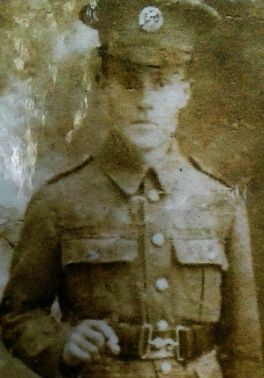 J. Parr, Middlesex Regt., 21 August 1914. 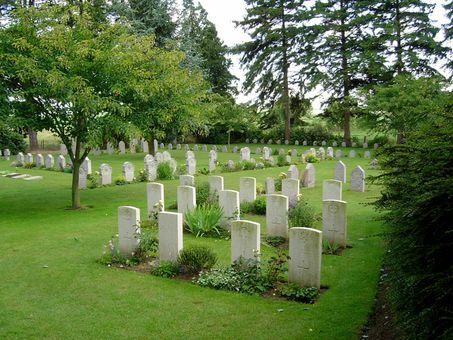 (13) Germans graves in the back ground, Commonwealth plot in front, with G. L. Price's grave 3rd row, second from the right. 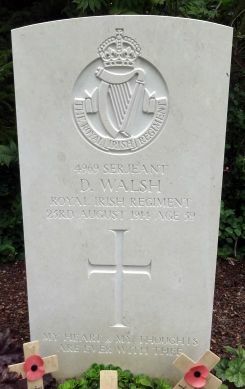 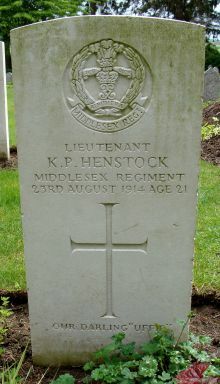 (PRICE) The grave of the last believed Commonwealth soldier, killed on battle field, Pte. 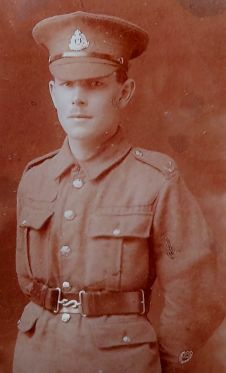 G. L. Price, Canadian Infantry, 11 November 1918. 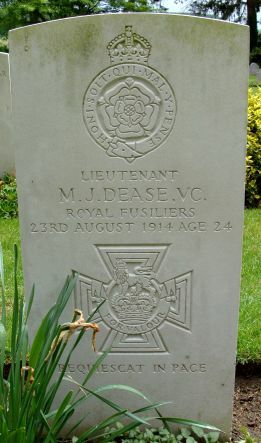 (DEASE) The grave of the first killed on battlefield who have been awarded of the Victoria Cross, Lt M. J. Dease Royal Fusiliers, 23 August 1914. 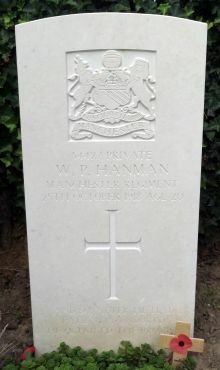 Son of Edward and Rosamond Mason, he was from Tottenham in London.